Demographic change is a serious topic in European politics, even if you don’t hear the term too much. From pensions to the labor market, a lot of the pressures on European economies are related to the idea that Europe’s population is getting older, therefore declining, and not enough young Europeans are being born to replace them. As a result, social programs get over-burdened and economic output suffers, among other problems. You might have heard about Hungary’s Viktor Orban telling Hungarian women they can live tax-free if they have four Hungarian children. That’s to fight demographic change, explicitly without recourse to increasing immigration (which Orban is not a fan of). Germany has implemented some more mundane incentives to promote childbirth which are seeing some benefit, but overall there is an agreement among policy-makers and academics that some amount of migration, from both the EU and further afield, is needed to keep Germany’s economy going. Education is one of the aspects of demographic change that doesn’t get the same attention as population makeup and labor markets. There are fewer German students enrolling in 41 universities around the country, with low birth rates and depopulation particularly stark in the East. This could have profound costs to the respective regions of these universities, many of which are isolated and with an ever slackening connection to the growing ‘knowledge economy’ deemed all-important amid an industrial decline in Germany. Many of these universities are seeing what enrollment they still have bolstered by international students. As domestic numbers decline, Germany is seeing a record number of foreign students enrolling, and foreign students now make up more than 10% of total enrollments. A report from the Research Unit of the Expert Council of German Foundations on Integration and Migration (known as SVR) recommends this continues, especially outside the big cities; Germany’s regional universities should make themselves more attractive to international students and German state governments (Landesregierungen) ought to make it easier for them to come. 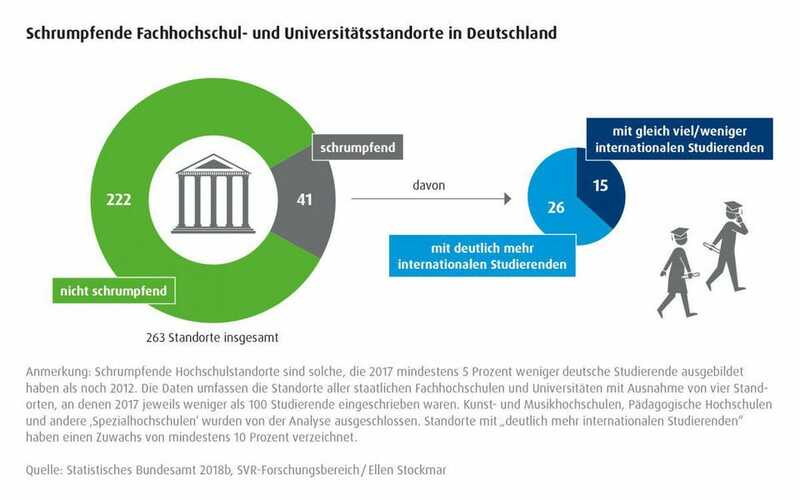 A slide from the Expert Council of German Foundations on Integration and Migration report “Countering Demographic Change”, showing the share of international students is higher than average in nearly two-thirds of Germany’s shrinking universities. Credit: Image courtesy of SVR Germany. “International students who stay in Germany as skilled workers are one of the biggest talent pathways we have,” said Simon Morris-Lange, Deputy Head of SVR’s Research Unit. “Many blue cards (German high-skilled work permits) are awarded to former international students. Those students who stay outnumber those who come here as skilled workers from outside of the European Union.” According to the German Federal Office for Migration and Refugees, just over half of all international students who complete their studies choose to stay in Germany after graduation. With over 350,000 foreigners enrolled in German universities in 2017, that’s a lot of potential workers. 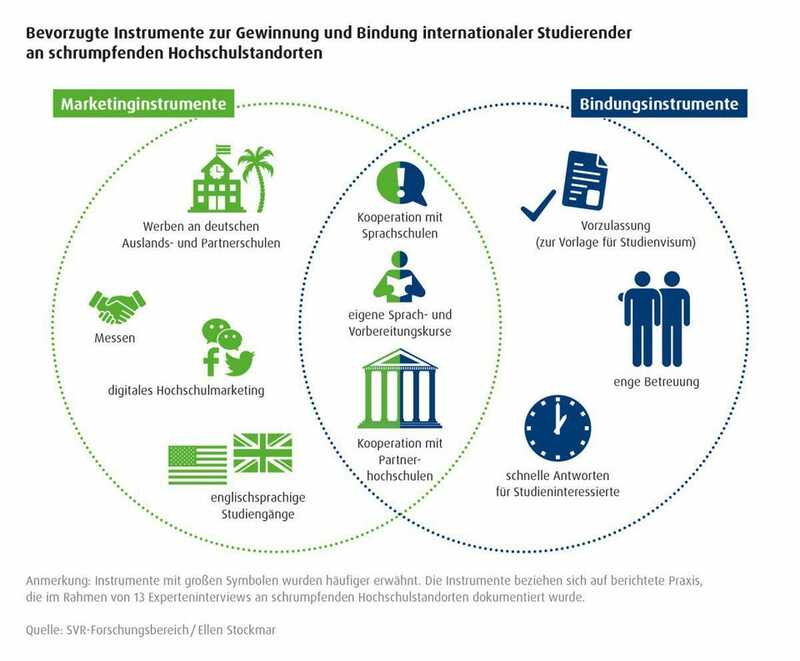 The SVR report recommends German states and universities offer more flexible options for international students. A key recommendation is more case-by-case assessments of prospective students’ credentials rather than blanket admissions criteria. In most states, said Morris-Lange, “instead of looking at the individual person, we look at different countries’ school systems and try to extrapolate whether, for instance, a Bangladeshi high school diploma is sufficient to be admitted.” This blanket system can often mean foreign students would need to enroll in foundational courses before their degree, which can be both costly and time-consuming and ultimately push a potential student elsewhere. Currently, only five states offer these individual assessments.